Increase workplace essential skills of people entering and employed the fisheries sector. Address local labour market and workforce challenges. Help Islanders who are unemployed/underemployed find and maintain employment. Create a training model that is innovative, sustainable, customizable and transferable to other communities across Prince Edward Island and Canada. Free training for your new and returning employees. Free training for your supervisors and managers. Increased productivity and reduced errors. Wages subsidies for work placement terms. 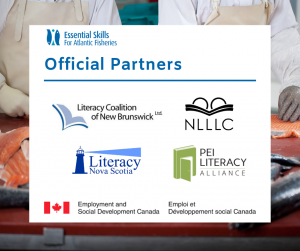 To apply to be an employer please email lily@peiliteracy.ca or call 902-218-8484. Upgrade your skills and capabilities for the workplace. Add a new certificate to your resume. An opportunity for a paid work placement. A new Chromebook Computer to keep upon completion of your training. To apply to be a participant please email lily@peiliteracy.ca or call 902-218-8484. Mentoring in the Workplace and Leadership – these are training courses that will be provided for a team of your employees who you identify as your leaders/managers/mentors. Chromebook Computer Training – we provide to all 5 week course participants. The training curriculum for ESAF participants and mentors has been developed by the College of North Atlantic, Newfoundland. Course facilitation for Prince Edward Island will be delivered by Workplace Learning PEI. ESAF PEI Project Coordinator is Lily Reaman of PEI Literacy Alliance. ESAF is funded by Canada’s National Essential Skills Initiatives. Subscribe to our ESAF newsletter by clicking here.